FARNBOROUGH, United Kingdom – LATAM Airlines Group S.A., Latin America’s leading airline group, and world-class airline Qatar Airways, both members of the oneworld alliance, announced today that they have entered into a subscription agreement providing for Qatar Airways to acquire up to 10 per cent of LATAM’s total shares, which will be acquired in connection with a capital increase. As provided for in the subscription agreement, LATAM Airlines Group will hold an Extraordinary Shareholders Meeting no later than 2 September, 2016 to propose a capital increase in the amount of US$613 million through the issuance of new shares at a price of US$10 per share. 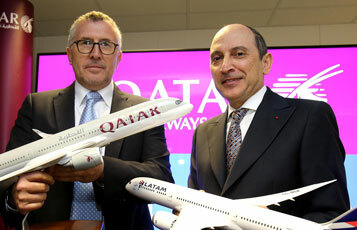 The announcement was made at the Farnborough International Air Show in England, by both airlines’ CEOs: His Excellency Mr. Akbar Al Baker, Group Chief Executive of Qatar Airways and Mr. Enrique Cueto, CEO of LATAM Airlines Group. “LATAM represents an exciting opportunity to invest and support the development of our long-term relationship. 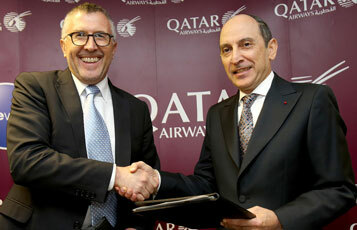 As a leading airline in Latin America, and key member of oneworld, this investment provides potential opportunities for Qatar Airways’ global network, alongside our successful investment in IAG,” said His Excellency Mr. Akbar Al Baker, Group Chief Executive of Qatar Airways. “We are proud to announce Qatar Airways as a new shareholder of LATAM, reaffirming our bond as existing members of the oneworld alliance. This investment recognises LATAM’s achievements and supports our project for the future. In addition to strengthening our financial position, it will allow us to explore new opportunities for connectivity with Asia and the Middle East, as well as other potential areas of cooperation,” said Mr. Enrique Cueto, CEO of LATAM Airlines Group. The companies expect the transaction to be completed within the fourth quarter of 2016. Qatar Airways was advised by HSBC Bank plc, Weil, Gotshall & Manges LLP and Carey, whilst LATAM Airlines Group S.A. was advised by JP Morgan, Claro & Cía y Sullivan & Cromwell.